“Flying” is the only instrumental written, recorded and released by The Beatles. It was part of the original score for the film “Magical Mystery Tour”. It is filler. Good filler, useful filler but filler none the less. I don’t believe that the Fab Four for one moment took this track terribly seriously. To me it sounds like a loose twelve bar construction with a cute melody that has been tarted up. The sounds are pretty interesting though. Ringo plays a proto-hip hop beat that would not have been out of place on an early De La Soul record. I’m a little surprised that “Flying” has not been sampled for a track or two. And then there is tons and tons of mellotron. I’m always a sucker for the mellotron. This magnificent machine is an early version of a sampler using tapes of instruments triggered from a piano keyboard. It reminds me of the movie “Brazil” by Terry Gilliam in a retro-future way. All four Beatles added the chanting, and the track fades in an assortment of tape effects created by Lennon and Starr. The original version of Flying was much longer, 9 minutes or so. John and Ringo built up a rather lovely sound piece using The Mellotron, tape loops and sound effects. It sounds like a kinder, gentler uncle of the brutal “Revolution 9” that John recorded about a year later. The longer “Flying” is more ambient, more Enoesque. It reminds me of "Moonchild" from “In The Court Of The Crimson King” by King Crimson. The short version “Flying”, despite serving a purpose in the film, is about as interesting as taking a very long cross continental flight. That is to say “not very”. Sometimes, it has to be said, the Fab 4 made some stuff that was just OK.
Because they were and arguably the biggest thing since shoelaces it is often argued that everything The Beatles did was genius. People have claimed that they have secretly smuggled tapes of them beating their heads with empty cigarette packets and it is pure genius. If a normal mortal were to beat their head with a cigarette packet it simply would not sound as good. People have claimed that they have secretly smuggled tapes of them beating there heads with empty cigarette packets and it is pure genius. If a normal mortal were to beat their head with a cigarette packet it simply would not sound as good. I believe it is more interesting to﻿ discuss what works and what doesn`t, rather than making excuses for duds, and why songs like "Flying" are really interesting masterpieces. Each of The Beatles have admitted that some of the tunes were simply not that good. "Flying" was originally titled "Aerial Tour Instrumental" which is exactly what is was in the soundtrack of the film “Magical Mystery Tour”. The music is accompanied in the film by colour-altered images of landscape in Iceland taken from an airplane. I believe that The Beatles used Stanley Kubrick’s unused footage from 1964 film Dr. Strangelove for this video. It all looks rather dated now but I am sure it had a certain “Je ne sais quoi” but I have no idea what that might be. The ukulele version of “Flying” is performed by Tim Ouimette and his band. Tim is unashamedly a working Jazz musician. It is often thought that The Beatles were the enemy of jazz. Until the pop revolution ushered in by the Beatles, jazz really was the respectable alternative to classical music. Most students and hipsters had records by Miles Davis or Dave Brubeck in their collection. Then along came the Beatles and everyone suddenly saw that pop could be quite good and jazz went into the doldrums. They didn’t buy it any more, and thousands of jazz musicians starved to death in the wonderful Sixties. "Jazz is just a lot of old blokes drinking beer at the bar, smoking pipes and not listening to the music." This was dreadfully unfair. Not only was it dreadfully unfair, it was dreadfully true. But John Lennon was also an aficionado of jazz. One of his favorite performance pieces in Hamburg, recorded by the band in June, 1961 under Bert Kampfaert’s direction, was the 1920s jazz hit "Ain’t She Sweet". There is even a version sung by the three surviving Beatles in the ’90s, at the time of the release of their Anthology series. Lennon’s first group, the famous Quarrymen was a skiffle group. Skiffle was homemade music fashioned with guitars, broomstick basses and washboards, and is really just another name for 1920s jug band jazz. Paul’s love of 1920’s jazz is well documented and his recordings of “Honey Pie”, “Martha My Dear” and “Your Mother Should Know” reflect that love. Jazz always was nonconformist music. I think it still is. There is nothing more boringly mainstream than rock music, these days. Tim Ouimette’s experience as composer and musician for Ray Charles, Count Basie, Ray Baretto, Machito, Blood, Sweat and Tears, Dizzy Gillespie, Woody Shaw, James Moody, The Jaco Tribute Band and recording dates from the soundtrack to "Ray" to Grammy winners with Keith Richard and even Celia Cruz inform his eclectic arranging, composing and playing skills. A lifelong New York musician, Tim has been building an online music licensing company – Sound Q’s – with wife singer-songwriter Kati Mac. As a composer and trumpet player for TV, his music can be heard on everything from Dateline NBC and Monday Night Football to As the World Turns, The Guiding Light and Kathy Griffin among many others. Recently he has recorded with Delbert McClinton, and has contributed to Lenny White’s CD Anomaly, and Mike Clark’s Blueprints of Jazz. 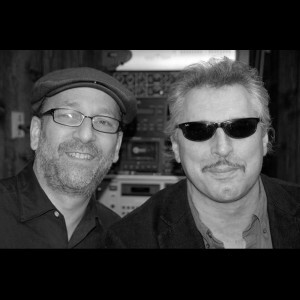 Tim has produced two CDs for Ben E King and headlined with him at the Blue Note in New York. He has been leading the Big Band since 1997 including a 4 year stint at Yee Olde Tripple Inn in midtown, a hangout for hipsters and denizens of the near dawn. Jon Cobert is a New York-based composer/arranger/pianist/session keyboardist/vocalist. He got his Music Theory and Composition degree from N.Y.U., and began his career with a bang, recording and playing live with John Lennon (you can see him in the movie "Imagine"). Other recording and touring credits include John Denver, Klaus Nomi, Laura Branigan, Phyllis Hyman, Al Green, Henry Gross, Linder Eder, Leslie Uggams, Harry Chapin, and Dion, among others. He has played with Bruce Springsteen, Jackson Browne, Richie Havens, Taj Mahal, John Mellencamp, and many more. He recently appeared at Madison Square Garden in the tribute to Pete Seeger’s 90th birthday concert. Since 1988, Jon has been working with Tom Chapin, recording, touring, writing and arranging, and producing. He has earned 5 Grammy nominations for his work as producer on Tom’s recordings. Jon is an arranger, producer, pianist, and engineer on the recently-released CD "Just You, Just Me", by Regis and Joy Philbin. He owns and operates a Protools HD recording studio. In addition to being a sought-after studio keyboard-player, Jon has written many songs, and he has released a solo album titled "Here’s Your Canoe", available from CDBaby.com. Jon has also been writing and arranging music for TV and radio, and some of his work includes: ESPN Baseball Tonight Theme, ESPN College Football Gameday Theme, Dr. Pepper, Pepperidge Farm, Rolling Rock, Budweiser, Arm and Hammer, Juicy Juice, Canon, Burger King, Wendy’s, Capital One, DanActive, and many others.